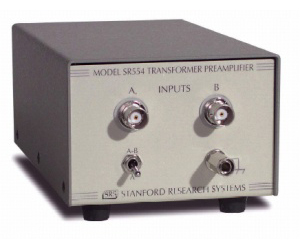 The SR554 is a low-noise, transformer-coupled preamplifier optimized for source impedances between 0.05 W and 1 kW. With an input noise of only 0.1 nV/ÖHz, the SR554 can be used in a wide range of low-noise applications. It is the ideal preamplifier for low-temperature synchronous detection applications where isolation between the experimental sample and the lock-in amplifier is critical. The SR554 can operate in one of two modes. In the "bypassed" mode, the instrument is simply a passive transformer with a turns ratio of 100, providing an overall voltage gain of 100. In the "non-bypassed" mode, an additional amplifier with a gain of 5 is added increasing the gain to 500 and providing a low-impedance (<1 W) output. In the bypassed mode, the SR554 requires no external power. When using the output amplifier, ±20 VDC must be supplied. The preamplifier connector on SRS lock-ins can be used to power the SR554.